Need some Christmas party makeup inspiration? ‘Tis the season to turn up the glamour a notch and to try out some dazzling new looks. Christmas is an exciting time for make up enthusiasts, so we have handpicked a selection of simple tips and tricks for putting a festive spin on your everyday makeup looks. So, ladies, dig out your best party wear that has been gathering dust at the back of your wardrobe and get ready for more glitz and glam than you could ever imagine! When you think of Christmas party makeup, chances are that a classic red lip will spring to mind- the unsung hero of all Christmas party makeup looks- so it seems rude not to mention it. You could stick to what you know, but a berry, vampy lip and long lash combo is all the rage this party season. 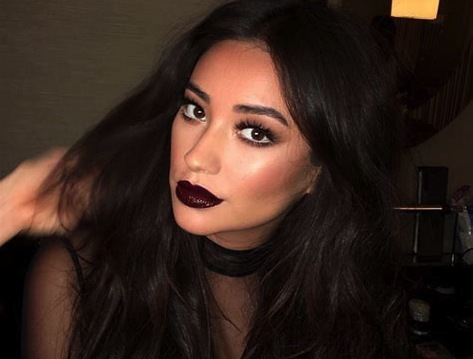 You might be tempted to pair your dark lip up with a smoky eye, but Shay Mitchell’s fresh, modern take on the winterberry lip has shown us that it is possible to look fresh and cool as hell in dark lipstick. When it comes to this look, lip liner is a girl’s best friend- with the exception of a heavy-duty lip balm to avoid the curse of the chapped lips. Pick out a lip liner that seamlessly matches your lipstick colour of choice and carefully carve out your lip-line before applying your lipstick with a light hand. To mimic Shay’s vampy winter berry makeup look, keep your base light and your eye makeup even lighter. Shay paired her glossy, burgundy lip with a strong contour and a set of long, fluttery lashes, leaving her with an overall sultry, yet festive, feel. Are you brave enough to rock this daring makeup look at your Christmas party? The unspoken rule of creating a perfect balance between your eye makeup and lip colour is being thrown out with the old Christmas decorations this year. Be the life and soul of the Christmas party with a bold eye look matched with a statement lip. In the spirit of Christmas, try out new, daring combinations that pull you straight out of your comfort zone. We can’t find a combination of shades that are more associated with the Christmas season than green and red, so don’t shy away from playing with colours and give everyone the Christmas tree realness they deserve. 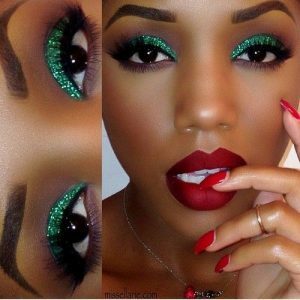 If you’re not brave enough to go for a solid, bold green eye look, add a pop of green to your waterline or lash line to give a festive twist to your christmas party makeup without going OTT. Winter is coming, and that means it’s time to channel your inner ice queen. Up the ante on your classic blue toned smoky eye with festive artwork that is sure to bring the party feel this Christmas. 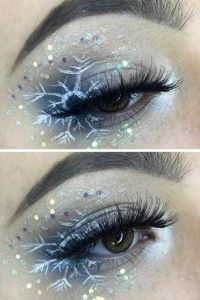 Using a snowflake as an accent to your eye look will add a subtle pop of festivity. This may seem like an unnecessary step for the Scrooge’s out there, but we think that there are no limits to creativity at Christmas. To recreate this striking seasonal eye look, stick with a classic blue, white and silver combo to perfectly reflect the classic winter colours. Focus the blue on the outer corner of your eye and the silver in the inner portion to create a seamless transition of colours. Use a white, thin eyeliner to give yourself as much precision as possible when creating your snowflake – a steady hand is essential to perfecting this kind of design. If you want to take your look to the next level, use a highlighter with a blue undertone to give yourself an inner frosty glow fit for an ice queen and, of course, douse yourself in glitter. Now that we’ve given you some Winter inspiration, it’s time to unleash your imagination and create your own glam Christmas party makeup looks. We can’t wait to see what you come up with! For more information about our Christmas beauty packages, get in touch today. Just tell us your dates/times, your location(s), capacity and theme, and we can provide a one-to-one personalised consultation to help achieve all your Christmas beauty desires!